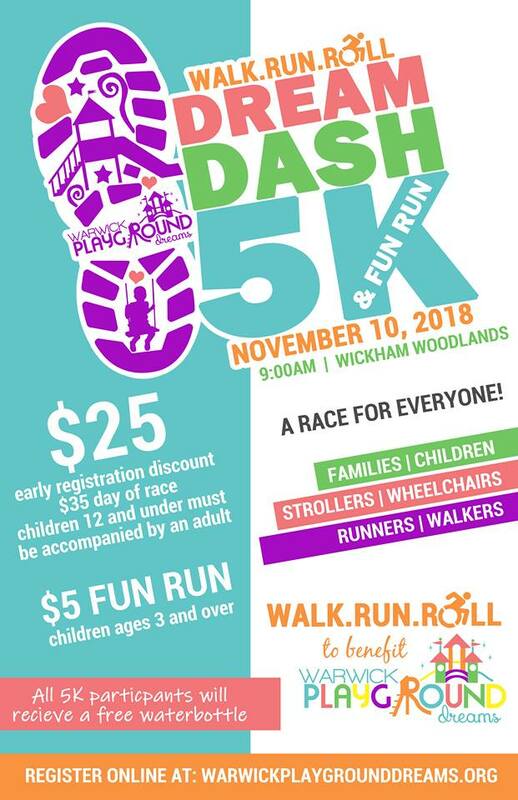 Come join Warwick Playground Dreams for their 5k Dream Dash Walk, Run and Roll in beautiful Wickham Woodlands Park in Warwick, NY. Like the playground for which it is raising funds, this 5k will welcome everyone to participate, whether running, walking or rolling using a wheelchair or stroller. The Dream Dash’s 5k will wind through scenic Wickham Woodlands. The course has been carefully planned to ensure its accessibility for those using wheels and is fully paved with no steep slopes. After the 5k, a Fun Run and 1-Mile will be held for younger children. Each participant will get a keepsake water bottle. Bring your favorite colored tee to screenprint your own race shirt, for a small donation! The course will start near the Wickham Woodlands Manor and head past old buildings of the former Mid-Orange Correctional Facility before leading down to beautiful Wickham Lake. Participants will enjoy running past vistas of the scenic Warwick Valley and surrounding mountains before heading back toward the old State School dairy barn, looping back up and ending at Wickham Manor where participants will be greeted with a continental breakfast and festivities. The Kids’ Fun Run will be held alongside Wickham Woodlands Manor. All proceeds from the event will go towards a new playground for children of all ages and abilities in Stanley-Deming Park, Warwick. Race Day-Registration and Packet Pick-Up opens at 7 am at Wickham Woodlands Manor, 225 State School Road, Warwick NY 10990. 5k Race begins at 9 am! This is a rain or shine event. The Kids' 1-Mile will also begin roughly 45 minutes after 5K start time, so that parents running the 5K may have enough time to get back in time for their children’s Fun Runs and 1-Mile. A parent may accompany a child running the 1-mile free of charge. The parent will not receive a race bib but will need to sign a waiver, if they have not already done so for the 5K. The 1-Mile will not be an officially timed event. Kids' Fun Run will run alongside Wickham Woodlands Manor once 5k has concluded. Entrants who register early will receive a pre-registration discount. For a limited time, racers can register online for $25.00. Race day registration will be $35.00. The fastest 5k male and femaie participants will win their choice of a Warwick Playground Dreams engraved brick or picket. Pre-registration closes on Friday, November 9th at noon. Registration will include water, continental breakfast, and a keepsake water bottle, while supplies last. Parents or guardians will be required to sign a waiver for any participating children under the age of 18. Would you like a race shirt? Wickham Works will join us with a silk-screening station. Bring along a canvas bag or plain colored shirt to screen yourself for a $5 donation! We will be printing with white ink. Parking will be available in the Wickham Woodlands Manor lot as well as along State School Road.